Looking for great domain names? NamesThat.win webiste is now fully operational. Our name comes from Chignecto Bay, located just above Fundy National Park in the Bay of Fundy. The tides in the Bay of Fundy have the highest tidal range in the world. As our name implies, this website is a meeting place for different ideas and services. These include travel, education, tourism, domain names, writing and more. Small is beautiful. Thanks for visiting. Looking for Bay of Fundy science and travel information? Check out our Bay of Fundy site. 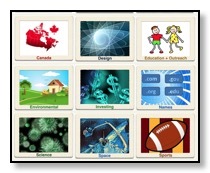 We periodically do independent reviews of science related iOS apps - see scienceapps.blogspot.ca. Over 175,000 people have checked out our reviews, why don&apos;t you? We are just setting up a new website for science app reviews at http://scienceapps.review. We offer a domain name service specializing in Canadian travel, science, design, technology, education and outreach. Check out our NamesThat.win site that has a selection of reasonably priced domain names. Interested in Canadian investing information from a Canadian perspective? Please visit our FundsGarden blog. Our photographic products online store is now closed. We may offer online here a limited number of photos starting early 2019. We thank our many customers over the past decade for your interest in our products and support. Feel free to contact us regarding product support. We are available for speaking on science and education (space, astronomy, physics, Canadian inventions, specialties). We offer this service free to schools and non-profits in the local Victoria, BC area. If outside the area, or for other types of organizations, contact us to discuss details. We place a limited amount of advertisement on our sites to cover our expenses. If you would like to discuss details and rates send us a brief message. We only accept advertising that is related to the website (i.e., for bayfundy.net we consider travel, event or book advertisements from the Maritimes; on NamesThat.win we will consider brand name, domains, web hosting, etc. ads). Have a different question? Don&apos;t hesitate to contact us with this form. Our Chignecto Twitter account mainly covers travel, photography, happenings and history of the Bay of Fundy region.